Cracker Recipe - this is an easy raw food recipe! This is a delectable, seed cracker recipe that is super high in fiber, low glycemic and has lots of omega 3 fatty acids! One of the best things about it is it requires no cooking. You don't need a fancy food drier either because you can dry the crackers in your oven on very low heat. 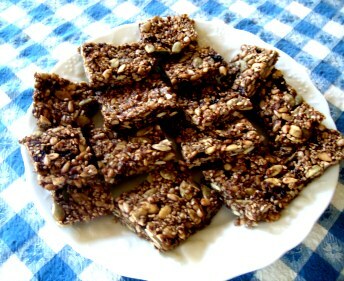 Because it's raw and has no flour it's NOT carbohydrate dense which makes it the ideal snack for managing your weight. These crackers will give you energy, have good fats and are far healthier than any expensive energy bar you would buy. You can make it savory with your favorite seasonings and garlic powder or you can make it sweet as I have it here. If it's savory you could put hummus on it. This is one of the simpler raw food recipes because it does not require too much preparation. Once you get all the ingredients together it's just a matter of mixing it all up. It will be a bit "stiff" so it takes a lot of stirring. You can separate the mixture into two bowls and work on them for a while individually before mixing the entire concoction together. About a cup or more pear or apple juice, enough to cover the seeds. Place all the ingredients in a large bowl and stir thoroughly to mix. You want just enough juice to cover the seeds. Once you've got it thoroughly mixed, cover with aluminum foil and place in the refrigerator for several hours. The seeds will soak up all the moisture. When you take it out it should be quite sticky and easily pushed together. The flaxseed meal is the "glue" that holds this together. You can leave out other ingredients or double up on what you like but you cannot leave out the flaxseed meal! If you like you can add just enough agave syrup to give it the "stick togetherness" to be able to flatten it out on cookie sheets or dryer trays lined with parchment paper. You want it flattened to the thinness you want your cracker, 1/4 - 1/2 inch thick. Place the trays in the food dryer or if you don’t have one set your oven temperature to 100 degrees. Place the cookie sheets in the oven. The thinner the seed mixture is and the longer you leave the crackers in the oven, the crispier they will become. I like mine chewy and leave them in about 6 hours. This cracker recipe can be made into a savory cracker. Instead of the cranberries or raisins you can add garlic powder, salt, pepper, granular kelp or spike, whatever catches your fancy. For moisture you could just add water to cover. You might also try vegetable juice. Once the seeds have soaked up the liquid you can always add a little more to get them to stick together. You could even try grating some hard cheese into the seed mixture. This is the time to get creative! These crackers make a great low glycemic snack with a glass of unsweetened almond milk, whole milk, or a smoothie! They are incredibly high in fiber and will give you good energy. They also have the advantage of being gluten free crackers for those of you who are sensitive to the gluten in wheat. Try them for breakfast or dinner with a fruit or vegetable smoothie!. Yes, this is a good fat loss strategy along with an overall low glycemic plan. Return from Cracker Recipe to Low Glycemic Recipes. Return from Cracker Recipes to Lifetime Fat Loss home page.